Tagged John Sweeney, Romney. Bookmark the permalink. I am truly astonished – is the someone pretending to be Webb? I guess Anthony Wiener was right – there are people hacking Twitter accounts after all. Good for ol’ Justin. For once he provides a voice of reason regarding the US. Credit where due. Too bad this doesn’t really balance it out. Not a surprise. His Tweets often give the GOP a good hearing. This does make a change from ol’ Justin suggesting that Sarah Palin is unfit for public office due to her religious beliefs. He was brought up a Quaker, so probably has a soft spot for religious minorities too. In other words, a bias which manifests itself in his professional activity. Or a predilection towards porridge. Ah but the Beeboid DNA will out. Couldn’t let it pass without having a dig at all religions but then having an extra go at Catholicism and lumping it in with Islam. He could have said Canterbury but no, it’s that old DNA again and Beeboids simply don’t see it. I suppose the Jews should be grateful that they too got let off. And I don’t think John Sweeney or Justin Webb would be allowed into Mecca. If only Justin Webb could appreciate that his propaganda double act with the French leftie last week trying to blame Sarkozy for the ‘racist’ killings in Toulouse made his journalistic credibility less than convincing. 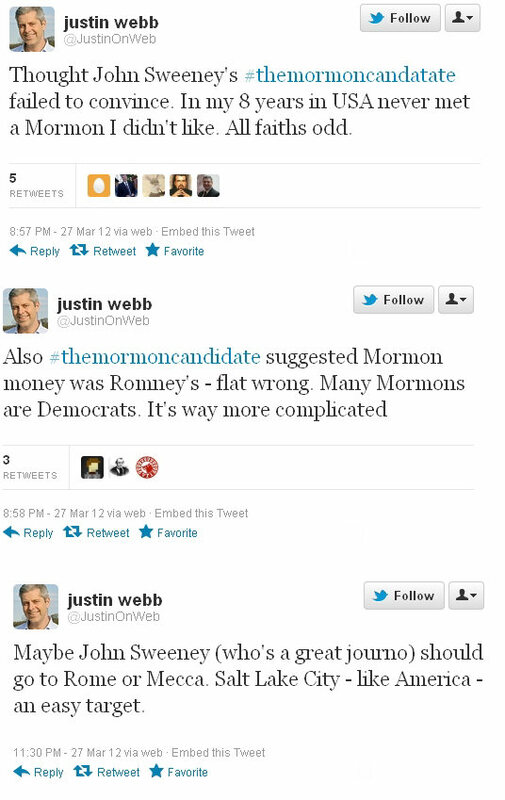 Perhaps Webb could have a word with his successor about spelling out some of those “odd” beliefs and saying that a British Mormon politician would indeed be questioned over them. Sweeney’s director James Jones has worked on a couple of C4 projects with Peter Oborne – “It Shouldn’t Happen To A Muslim” (plus accompanying pamphlet “Muslims Under Siege”) and “Friends in High Places” which attacked the pro-Israel lobby in the UK. Interesting that his righteous sense of injustice on behalf of Muslims doesn’t extend to other religions (and not just Mormons – that tweet of his mocking Christians because of their singing spoke volumes). Mardell and his fellow travelers wouldn’t dream of questioning the beliefs of a Mohammedan politician, or commissioning a film on a relative who had abandoned Islam in anger. The double standard couldn’t be more obvious. Mormon among the new intake of MPs – David Rutley, Conservative MP for Macclesfield. Before entering politics, he was a senior executive at Asda, PepsiCo, Halifax General Insurance and Barclays. Funny that those corporations hired a crazy Mormon, eh Mardell?